AutoTight: Complete Connections for shear wall performance. The AutoTight provides the tight connections needed for full shear wall performance. We work with developers, contractors, architects, engineers, in providing cost effective systems. 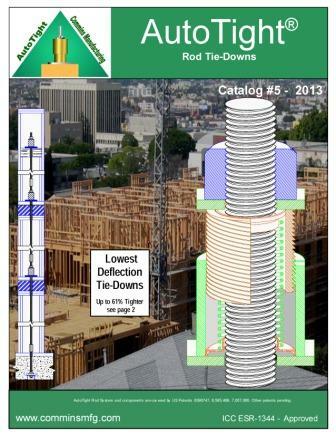 The AutoTight catalog provides the information needed to understand and specify a rod system. Download the information you need or request a catalog at autotight@comminsmfg.com or call (360) 378-9484. As a service we design complete tie-down systems. When the necessary information is provided (See catalog page 7) we can design complete systems in as little as 15 minutes. AutoTight will also convert other systems. Contact the factory autotight@comminsmfg.com or 360 378-9484 for information. Please note that updates have been made from the current printed catalog. Always check the website for the latest version. The online catalog is #5 March 2013. Acrobat Reader is required to view the material.